Nanostructured materials based electrochemical biosensors are being increasingly developed for the diagnosis of multiple infections and diseases for personalized health care. Nanostructured platforms with needed electro-active surface with multiple attachment charged sites and functionality provide an effective solid support to immobilize biomolecules with high biological activity and desired orientation/confirmation. These nanostructured platforms interfaced with bio-recognition and transducer for signal amplification achieved enhanced sensing performance. Amongst the family of nanostructured materials, organic-inorganic hybrid nanocomposites, especially chitosan (CH)-metal/metal oxide nanoparticles are being explored for effective and efficient biosensor fabrication. Such hybrid nanocomposites are showing properties different from their parent constituent precursors and are dependent on concentration of precursors, their morphology and novel interfacial characteristics. Studies have indicated that the sensing performance of such nanocomposite based biosensor can be improved by tailoring the precursor concentration, effective surface area, charge/functionality, electron-transfer properties and material–biomolecule interface through morphology engineering. 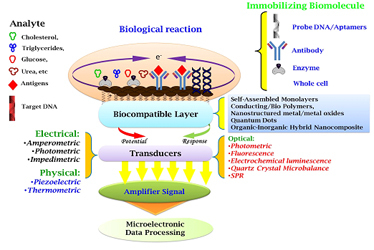 This review is an attempt to introduce the potential of CH based hybrid nanocomposite for the fabrication of selective and sensitive electrochemical biosensor for point-of-care-diagnostics.